Around the world, a number of animals are used for riding and draught. 1902. On heavy soil, oxen were preferred to draught horses due to their better pulling power. Early 1900s. Both of these photos were taken in Britain. 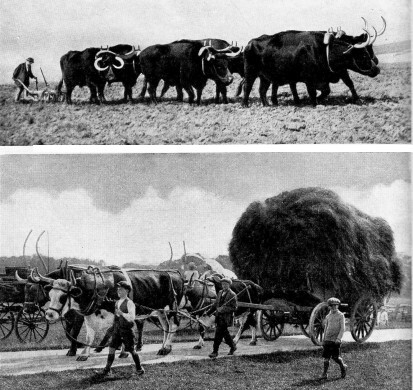 The upper photo shows a Sussex ploughman and his team of three yoke of oxen ploughing on the South Downs. 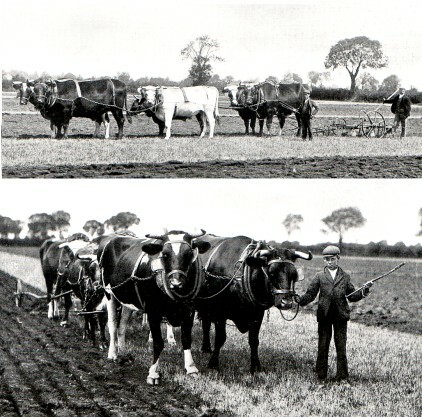 This was one of the last teams to be used for ploughing in commercial farming. 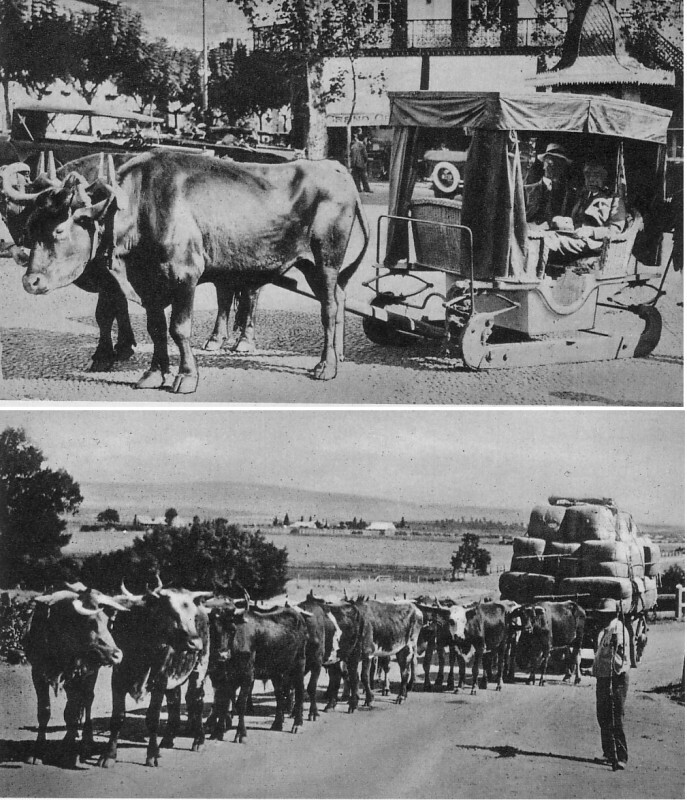 The lower photo shows a team of oxen pulling a hay cart on the estate of Earl Bathurst. Early 1900s. Top: The bullock-sled was better suited than a wheeled cart to the steep, narrow, cobbled streets of Madeira. Bottom: Where roads were poor, wool was transported across parts of Australia by bullock train. The lorries of the time could not cope with the poorly made roads. Early 1900s. Oxen were more common in India than in Britain and took part in state occasions, while British oxen were restricted to farm labour. The upper photo shows oxen cavalry on the frontier between India and China (it appears to be a cow/yak crossbreed). 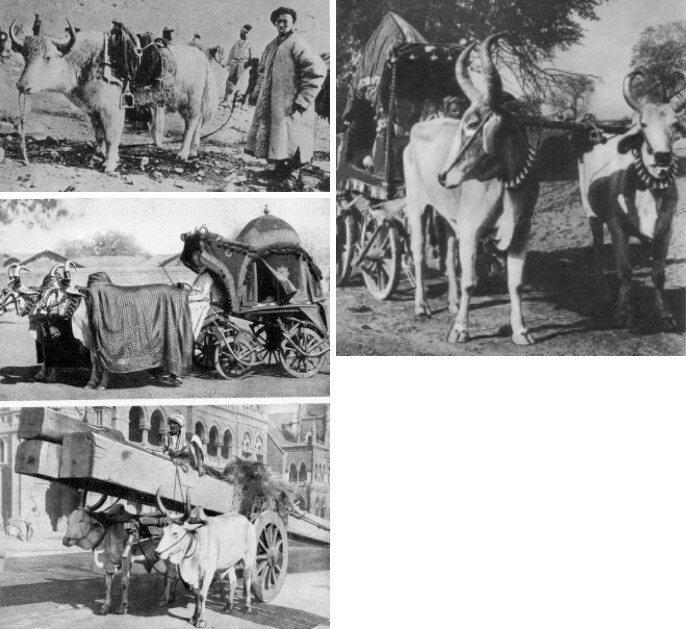 The middle and right photos show a zenana (harem carriage) belonging to a maharaja. The rich draperies are tailored to fit the shape of the indigenous humped oxen. 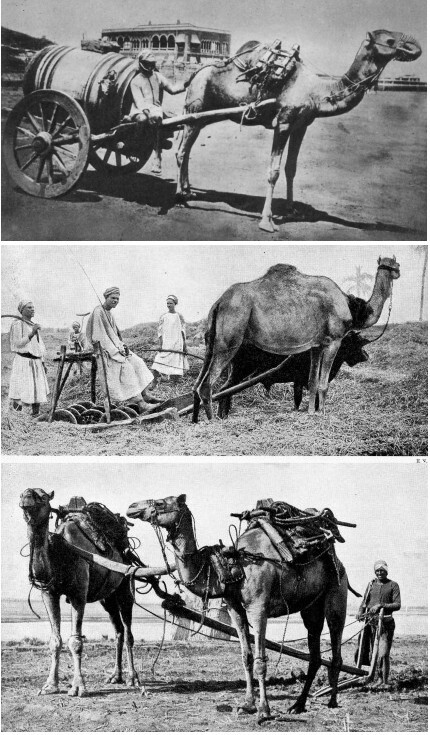 The lower photo shows oxen hauling a timber cart in Bombay. Early 1900s. Top: Camel water cart in Aden. Middle/Bottom: Ploughing with camels on the banks of the Nile in Egypt. 1929. 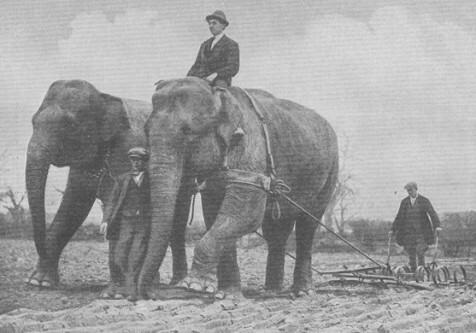 These circus elephants are being used to plough land in Surrey, England instead of using draught horses. During the winter, when the circus was not travelling, animals such as elephants had to earn their keep. Elephants might also be used to clear felled trees. As well as earning their keep, it also kept the animals fit. Not a working animal, but an unusual pet! Although hyenas are supposed to be untameable, there are at least two authentic records of them being hand-reared and kept as pets. A female striped hyena called "Ebby" was adopted by American Rose Butler in the early 1900s and kept as a pet for at least 13 years. 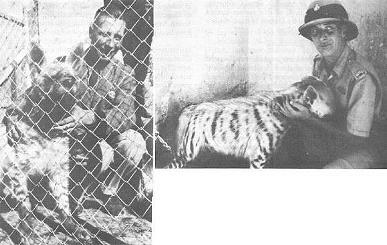 An abandoned male striped hyena cub was rescued and raised by Englishman Geoffrey J Morton in 1933 while he was serving as a policeman in Palestine. He found the tiny cub while patrolling in the Jordan Valley, and took it back to his quarters in Nazareth. He bottle-fed it and gave it meat scraps. He kept it at the police stables for about a year, taking it out for an evening stroll each day. When he was posted to Haifa he donated his pet hyena to Tel Aviv Zoo.